This Cobb fake was "slabbed" and certed by PSA/DNA. Hot on the heels of their reported authentication of a fake Ty Cobb signature on a Little League ball made fifteen years after the Hall of Famer died (as reported by us on Deadspin last Friday), PSA/DNA has made another monumental authentication error. 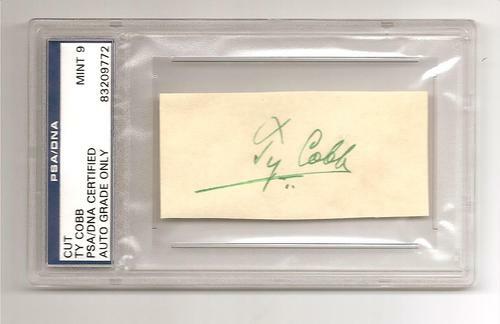 A Cobb item appearing on eBay for the past few weeks as an alleged cut signature of Cobb that was certified authentic and graded in one of PSAs air tight encapsulated holders was just pulled by eBay’s Fraud Investigation Team. Collectors refer to these items as “slabbed signatures” and they have become an extremely marketable commodity thanks to PSA who has sold consumers on the belief that such items certified by them are unquestionably authentic. The eBay seller BigDaddySportsCards of Alexandria, Louisiana, was offering it for almost $1,300.00 until the item was removed from the site earlier today. The seller was apparently sold on PSAs expertise stating that the, “Gorgeous Green Ink Cut” has been graded a “Mint 9″ by the company that is a subsidiary of Collectors Universe (NASDAQ: CLCT). Unfortunately for “Big Daddy” and PSA, the nation’s leading authority on Cobb’s signature happened to be browsing the eBay Cobb offerings and immediately determined the offering was a counterfeit. Ron Keurajian is the man who in 2009 told the Baseball Hall of Fame its Ty Cobb diary, purchased from Barry Halper, in 1998, was a fake. The FBI agreed with him and the diary, forged by Cobb’s biographer Al Stump and once displayed in Cooperstown, has been wished away into a cornfield. When Keurajian saw the slabbed Cobb cut on eBay he noticed something looked familiar about it. It was familiar because Keurajian actually owns the exact same authentic original signature that Cobb actually signed on a full-size government post card, not on a cut signature. PSA authenticated what appears to be a laser copied piece of paper (perhaps old) that features a facsimile of Keurajian’s original example. The PSA holder would have to be opened to determine what process was used to create the forgery. This is the authentic signed Cobb postcard owned by Cobb expert Ron Keurajian. The signature on the card was copied and used to create the PSA authenticated forgery on eBay. 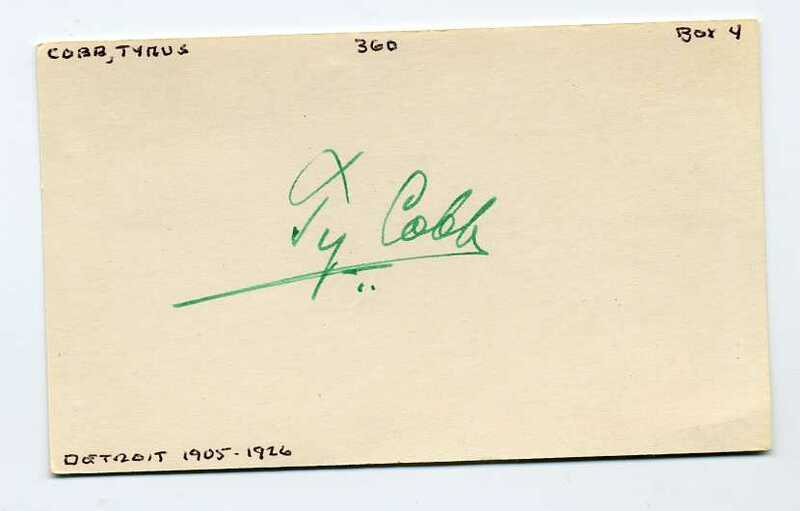 In 2009, Keurajian wrote an article for Autograph Magazine about Cobb’s handwriting and utilized this same Cobb signature as an exemplar in the article, which is still posted on the magazine’s website. The forger simply grabbed the screen image of his authentic exemplar and then proceeded to manufacture his fake. (The signature is also being utilized as an exemplar in Keurajian’s soon to be released book, Baseball Hall of Fame Autographs: A Reference Guide, by McFarland). This forgery was likely created with the help of a laser printer and some old paper. PSA deemed it authentic and slabbed it in one of its encapsulated holders originally created for graded baseball cards. PSA/DNA CEO, Joe Orlando, wrote a column in June of 2010, on the company website detailing the success of PSAs system of grading and slabbing cut signatures and also stated that the process created a great marketing tool for the sale of cut signatures, which have long been considered suspect by collectors and dealers. eBay's fraud investigation team had the bogus Cobb cut signature removed from the site after learning Ron Keurajian owns the original. But is it a real market? 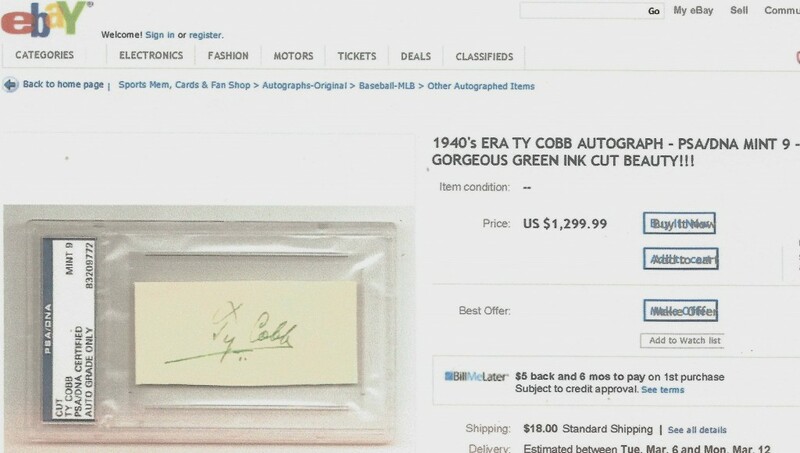 Is this Cobb fake indicative of other fakes included in the “hundreds of thousands” of autographs PSA has already slabbed? How many? Does this problem warrant a recall of all PSA slabbed cuts? Is this the only time this forger (or others) has fooled PSA in this manner? Nervous collectors holding PSA products in their own holdings are asking the same questions. Sources close to eBay operations confirmed to Haulsofshame.com that the Cobb cut was removed from the auction site “for authenticity issues.” The identity of “BigDaddySportsCards” was not available in order to ask who actually submitted the alleged Cobb signature to PSA for certification. Sources indicate the FBI, who have recently been taking a closer look at the business practices of the third party authenticators, are aware of the situation, which could represent an important lead in cracking down on forgery rings that have been flooding the market with fakes. Why should anyone be surprised? Since this item was submitted to PSA before it was encapsulated it simply appears there is no one at PSA who can authenticate anything that is genuinely signed by pen verses a laser printed item. My opinion is anything placed in one of these plastic cases needs to be opened and properly authenticated by someone with autograph experience and familar with authenticating autographs. Nothing from PSA (or any “authentication service”) can really be trusted ever again (not that I personally did in the first place). I thought PSA, BGS, SGC and the like would be a scourge to the sport collectibles market when they first entered the marketplace in the late 1990s, and this revelation only reaffirms that belief. Wish them ALL into the cornfield, son!!! People are funny and think of many ways to dupe the public,so I dont find this to be a strange case,just one that some fool got caught at doing.Lets chaulk up another one, for the good guys.Maybe ,just maybe some day,collecting will be fun again,without any worries of what is real or not real. As the owner & seller of this cut, I am currently seeking an explanation from ebay. I personally sent the signature in to PSA/DNA for grading & no, it is not laser printed as the author of this article has insinuated. The cut is written in clear green ink & the paper it is written on is clearly antique paper. Ebay & I are currently in a debate over the issue as we speak, and I expect full apologies from those involved in the misrepresentation of it’s authenticity. Considering that this cut was found with an array of 1930’s & early 1940’s original Goudey cards, I have little doubt that PSA/DNA missed this one. Ebay & the author of this article, however, should have done a little more digging before passing judgement. For clarification, we wrote, “….what appears to be a laser copied piece of paper (perhaps old) that features a facsimile of Keurajian’s original example.” The only way to know exactly what your cut signature is composed of is by removing it from its sealed casing and having it examined. Have you compared the signature on your cut with the signature on Keurajian’s government postcard? Are you suggesting that it is just a wild coincidence that the signatures are identical? 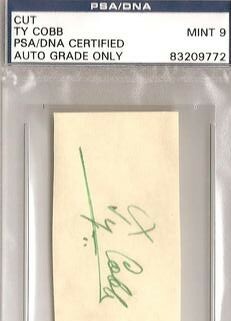 Where did you acquire this cut before you took it to PSA to be slabbed and authenticated? For clarification, you also wrote “the forgery”, “this forgery”, & “his fake”. I consider those very strong words from someone who has not examined the actual autograph itself. Also….do laser copies have indentation on the back of the paper from the copy machine? If so, please refer on where to buy them. Yes….I have examined Mr. Keuajian’s piece & yes….they are nearly identical. Considering that they were probably written by the same hand, I don’t find that very disturbing at all. I have two Ted Williams balls signed from the 80’s that you cannot tell the difference between. They are identical. As for it’s origin, the cut was found with a trove of original 1930’s & early 1940’s Goudeys, along with a bunch of period hard backed books like I mentioned previously. I purchased the estate. When I examined the signature & the tell-tale green ink with no pixelation & no signs of stoppage in the flow of the writing, I sent the cut to PSA/DNA, along with a 1939 Exhibits Ted Williams autograph. They were both encapsulated & returned PSA/DNA 9. One cut autograph amongst a treasure trove of books and Goudey cards, that would create some questons in my mind. And Mr Arabie you statethat you have examined Mr. Keurajian’s piece and that it is nearly identical to yours. Nearly identical? If it is nearly identical where are the differences? And while signs of stoppage are a tell tale sign of possible forgery, no signs of stoppage are not a tell tale sign of a non forgery. For further clarification your item is not genuine, however, without seeing it out of the casing I couldn’t tell you if it was a laser copy or an autopen etc. You should request a refund from the estate you purchased it from. Show them this article when you request your money back. Why not consign it to Heritage, they’d take it. What is the latest from psa on this one? Will they ever admit what they did? The latest on this is that PSA has now discovered an amazing forger has forged this Cobb. They don’t concede that it was done by a computer printer, they blame an “amazing forger” and have proclaimed that the autograph is not authentic. I will say this is some amazing forger, best I have ever seen . I should state that my statement above was based on statements on Net54 by Donavon, who does state that the amazing forger is the story that PSA told him. I don’t actually have first hand knowledge of what PSA has stated about an amazing forger. As reported in SCD by T. J…………………..
Amazing! If you go to the PSA website, and enter the cert number, they are still stating that this is an authentic autograph. Now who is telling the truth? The owner of the autograph who states that PSA told him it was an amazing forgery or the PSA website which states it is an authentic autograph. Just started collecting autographs…are cut signatures more of a risk then a ball or photo? should i stay away from cut signatures? and what about cards that have Cut signatures on them like UD and Donruss are they better then regular cut signatures? I can write a better cobb signature from memory and i already have ! I am Truly The Greatest ! I really enjoy your site at http://haulsofshame.com/blog/? lot for posting about it. The Authenticating of items seems like the Beckett Baseball Card Price Guide of the 1980’s in that a majority of collectors took the priceguide then as “bible” and that was it. I recall selling my 1984 Dinruss Don Mattingly rookie cards in 1986 for over a hundred dollars each. I was 12 years old, and I had what was a lot of money then $1000.00 in my wallet at school one day and I laughed at the fact I was able to get so much for these cards. I was told Id regret it someday. Still Laughing. The PSA DNA thing is so familiar to those times. Dictation of the industry and what holds value and does not. Sad how quickly history was able to have tricked us into not recognizing that it was repeating itself. Also, a shame I will not pay to get my 1940’s and 1950’s cards put in plastic slabs so they are worthless to some collecting nerds. Oh well.